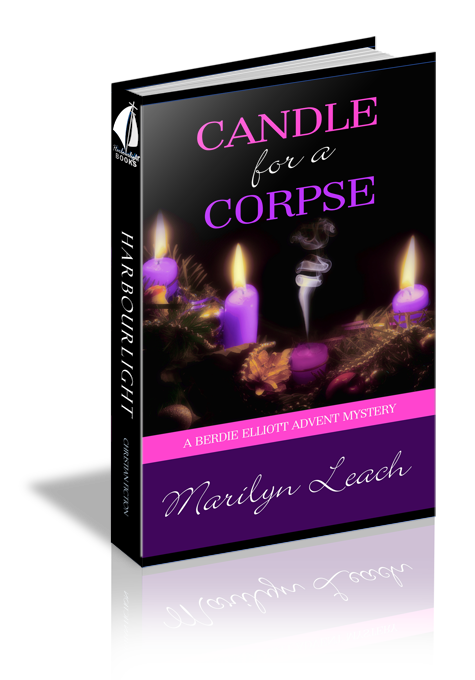 Who would guess that a simple Advent wreath would light the way to solving a Christmastide mystery in a small English village? Well, when Berdie Elliott—the local vicar’s wife and former investigative reporter—gets the scent, anything can happen. Though Berdie’s husband often disapproves, her divine gift of sorting truth from lies puts her in the stew. Along with her best friend, Lillie, Berdie unwraps far more than Christmas presents when an Advent gathering at the vicarage goes awry, and murder rocks the village. Lively newcomers, secret identities, a clandestine wedding, and a dissenting constable add to the adventure of unraveling the mystery that Berdie—to the delight of the entire village—finally ties up like a bright Christmas bow. Tea and biscuits anyone? In the grand hall, the front door opened, and the September rain raged upon the white marble floor. The North Sea squall had finally hit inland. The man stepped inside, pushed the formidable door shut, and then slipped out of his soaked overcoat. He shook the dead leaves that had littered the front steps from the soles of his shoes. Dampness of the English autumn permeated every corner of the hall that bore old World War II relics on its austere white walls. Sickly, yellowed, and drawn, his father motioned the valet to his side. “Up,” he growled. “No Klaus. I can do it.” The son pushed past the servant and maneuvered his father into a sitting position. With the flick of his forefinger, the master dismissed the valet from the darkened room. Faltering, he grasped at a wadded piece of newspaper from the night table at the bedside. The sweep of his arm toppled multiple medicine bottles, most crashing to the floor. His son sat on the edge of the bed, close to the beleaguered body of the man who was once robust and determined, the leader of armies. The old soldier pushed the paper into his son’s hand then grabbed the back of his firstborn’s neck, pulling him to his face. The beads of perspiration about the ill man’s forehead smelled of death. The old man slumped upon the pillow. The gripping hand loosened then fell limp to the bed. He writhed as if a giant hand pressed his chest. A faint breath escaped between his sallow lips. It was his last breath this side of forever. Berdie Elliott smiled. What an odd lot, she mused. The song filled the frosty night air as several carolers stood in the front garden of Twenty-nine Westwood Road. The village solicitor, Preston Graystone, stood shoulder to shoulder with the long-standing town electrician, Edsel Butz. A fine young university student, Mathew, and his childhood sweetheart, Cara Graystone, shared a caroling book with the electrician’s stout wife, Ivy. Mr. Raheem, the start-up greengrocer sang tenor notes with Mr. Webb, the recently elected council member. And there was the aged spinster, Miss Livingston, leaning on her cane, melodious and determined even in her old age. With her stood her constant companion, a dear but forgetful neighbor, Natty. The choirmaster, Lillie Foxworth, a bright, cheerful woman, conducted the carolers with great exuberance. All walks of life joined together, celebrating in festive song. Berdie snuggled closer to her husband, Hugh, and tucked her hair into her stylish, yet warmly practical, holiday hat. She felt the nip of the December night air on her nose and was sure it must be glowing holiday red. Her husband had often told her that her brown eyes held the warmth of a hearth fire. At this moment, she wished they literally could start a fire, because her large tortoiseshell glasses felt as chilly as fairy frost. Berdie’s wool blazer was doing a fine job of keeping that part of her body quite warm, but it fit a bit snug this evening. Though she had been involved in both energetic community service and active investigative journalism most of her life, having two now grown children had taken its toll. It all came with becoming “mature,” she decided. But then there was also the Devonshire cream she loved to lavish on her afternoon scones. It’s the holidays, after all, she excused. Neither bone-chilling weather nor the complexities of aging could lessen her joy in being here with this mix of people as she lifted her heart in song with them. They were, in a sense, family—all a part of her husband’s flock. Hubert Elliott carried his tall muscular frame with military bearing as befit a man with an honored past in Her Majesty’s Royal Navy. He had tried putting things right using armed force and discovered in the end that putting things right was more a spiritual matter. The very day of his retirement from service, he registered for seminary. Now here he stood, with his congregation and his wife. Beneath his dark winter coat lived the keen ability to put people at their ease. The silver hair, which some said gave him the air of a film star, was just barely visible beneath his attractive homburg hat with a curved brim. And it drew even more attention to those ardent blue eyes. Hubert’s voice became invigorated. Berdie shot a quick glance to the man with whom she had shared her heart and life for twenty-six years. He couldn’t deliver a tune in a wheelbarrow, but apart from that small detail, she knew he was the best-suited person in all of Great Britain to be the vicar of Saint Aidan of the Wood Parish Church. And although she and Hugh had been serving the parish for only three months, the majority of members were warming toward their new vicar. Berdie moved on with the jolly troop to the home of the present parish council chairman. It was the much-awaited moment for Miss Livingston to sing her exquisite solo. Though she was considered by many to be a bit of a curmudgeon, when she sang, all but the sweetest notes were left behind. The door was opened to the carolers, and Miss Livingston’s voice lifted in hallowed song. “O come, O come, Emmanuel, And ransom captive Israel.” Even at her advanced age, her voice was strong. “That mourns in lonely exile here, until the Son of God appear.” Berdie thought she caught a glint of tear in the woman’s eye. Then the rest of the chorus joined in. “Rejoice! Rejoice! Emmanuel, shall come to thee, O Israel.” A slight tingle played its way into Berdie’s awareness. How lovely was this moment of song, despite the cold. The transcendent solo behind them, the carolers moved on. They followed ancient cobbled streets to warm homes and cottages as was the tradition in Aidan Kirkwood on the first Sunday of Advent. Some dwellings boasted large back gardens. The tiny stone row houses were dressed for the English winter, and a battery of newly built dwellings were awash with fresh paint. When the troubadours moved across High Street, the usually vibrant shops were abed for the night. In no time at all, they approached Oak Leaf Cottage, the vicarage that was just a stone’s throw from the ancient church. Everyone was in anticipation of the evening’s Advent party, complete with the lighting of the ring. Upon arrival, three people were waiting at the decorated door of the vicarage. Mathew Reese, home from university for the weekend, handed his caroling book to his fiancée. The tall blond man—smartly dressed, trim, and handsome—put Berdie in mind of her Hugh when he was university age. “No Mat, we are not.” Mrs. Reese was untouched by the prevailing holiday spirit. “Why don’t you step into the library? Get out of this frightful chill,” Hugh offered. “We’ll stay right here, thank you.” Mr. Reese had fire in his voice. “Well, let’s the rest of us move in.” Berdie yearned for warmth. As soon as the manse door was flung open and the troupe entered, the smell of fresh pine mingled with the scent of cinnamon and oranges. It tickled Berdie’s nose like a Christmas partridge feather. The comfortable stone manse had been holiday dressed by Hugh and Berdie that very afternoon with help from her close friend, Lillie Foxworth. Polished woodwork showed off the fresh garlands draped around doorways, mirrors, and mantelpieces. Garland also wound its way along the central oak staircase that stretched up to the next floor. The evergreens were punctuated with deep burgundy bows and sprinkled with little gold stars that caught the light and seemed to beg a Christmas wish. The entry hall was alive with guests. Mr. Graystone removed his overcoat and hung it on a hook of the ample pub mirror. Berdie thought he rather looked like his name—gray stone. He was tall and angular, sharp-featured, with prematurely gray hair. Always dutiful, he helped old spinster Livingston with her long lavender coat, the poor woman getting her cane all twisted up in the works. By the end of the kind gesture, it became a tussle. “Silly man,” was all the silver-haired eighty-four-year-old offered Mr. Graystone as she scraped her cane across his newly polished shoes. The scars that littered her left cheek went crimson as she moved on to the sitting room. “Now Miriam, you need to thank the gentleman.” Natalie Bell known to the village as Batty Natty, had so few lucid moments. Natty was a neighbor to Miss Livingston, more like her shadow half the time. Natty reached in her pocket and pulled out a one-pound coin. “Thank you, sir, for your services,” she said to Mr. Graystone. Cara took the oldster’s coat and hung it on an empty hook. “I’m going in the sitting room, Natty. Come along.” She’d apparently decided against waiting for her fiancé, who was still talking with his parents outside. Ivy and Edsel Butz both looked at the decorations with delight. They were the only married couple in attendance besides Hugh and Berdie. Well, Mr. Raheem was married, but his wife was not a singer and so he was unaccompanied this evening. “Beautiful!” Ivy Butz exclaimed, hands spread wide. Edsel nodded his large head in agreement. These guests moved on to observe stands of airy orange pomanders throughout, holiday bowls of spiced nuts at every turn, and of course, the much-loved nativity set which had belonged to Berdie’s mother. It sat in pride of place on the sitting room mantel. The Christ child was conspicuously missing from the crib, and the three wise men were at the far end of the mantelpiece. On Christmas Eve, the holy babe would be placed in the waiting manger, and on Twelfth Night, the three wise men would add their presence to the stable scene. Ah, yes! This was the Elliotts’ living holiday greeting card; wishing joy, peace, and beauty to all who entered. The merrymakers drifted into the sitting room. While Hugh lit holiday candles, Berdie flew into the kitchen with Lillie, her best friend and comrade, on her heels. Hot spiced cider and tea simmered on the stove. Just then, Ivy Butz waddled into the kitchen with her usual jovial spirit, and Berdie was glad the electrician’s wife had interrupted the conversation. “And are you snuggin’ the holiday cheer?” Ivy laughed. Just the sound of Ivy’s voice brought a certain amount of glee into a room. “You found us out, Mrs. Butz,” Berdie piped. This was one of the few times Berdie had seen the stout woman without one of her children clinging to her skirt hem. Berdie had barely parted her lips to say, “Please do,” when the willing helper was out the kitchen door, teapot in hand. “Edsel’s father passed on just two years ago, leaving the family electrical business to him, and Edsel was the sole heir. With our recent building boom, he’s been busier than a goat in the garden, new houses springing up like April dafs. He had to hire a new man—well, an apprentice really.” Lillie picked up the fully laden tray. The front door chime rang. Berdie entered the hallway as Mathew Reese burst in from the front entrance, the lighted wall sconce casting a shimmer upon his fair hair. “I’m my own person now.” Raging, he slammed the door behind him. “Are you all right?” Berdie wondered at his hostile action. Suddenly, Mathew didn’t seem like a young Hugh at all. In looks perhaps, but certainly not in manner. The door chime rang out impatiently, once, twice, and a third time in rapid succession. Both hostess and guest stared at the door. “If it’s my parents, don’t let them in.” Mathew’s jaw set. Without comment, Berdie went to the door and opened it only to find Jamie Donovan listing off the front step along with Lucy Butz—Edsel and Ivy’s teenage daughter—and Mathew’s parents retreating from the gathering. Jamie, one step ahead of danger, was agile enough to regain his balance and hold Lucy with him. Poor Lucy seemed momentarily bedazzled. In the ado, her long auburn braid had wrapped around and given her a whack on her frosted cheek. Jamie put his arm around Lucy’s shoulders and helped her inside. Berdie closed the door behind them, delighted that she didn’t have to deal with Mathew’s parents at this present moment. She could resume being a hostess for her guests. “The rest of the people here aren’t nearly as inane as those two.” Mathew, who must have been looking over her shoulder, churned. “Jamie, this is Mathew Reese,” Berdie said. Jamie removed his knit cap, revealing coal black hair. His workman’s hands pushed the cap into a pocket of his woolen over shirt, and he tipped his head toward the golden boy. “Lucy, a rather mature crowd for you, don’t you think?” Mathew asked. “I’m sixteen in May.” She lifted her chin. Her heavily mascaraed eyelashes and a mouth swathed in slightly smeared lip gloss betrayed her first attempts in makeup. The sitting room door opened, and Cara Graystone joined the foursome in the entry. Her fitted ivory cashmere sweater reflected both her father’s rank as village solicitor and her position as his only child. An emerald solitaire, almost the size of Berdie’s Christmas platter, dwarfed her slim finger. Berdie sensed Jamie stretching up to make sure every inch of his five-foot-seven-inch frame was fully flexed. The young men reminded her of the picadors she’d seen at the bullfights in Spain, displaying their prowess to dazzle the crowd. “Did you know, Jamie, that in Latin advent means ‘to come’? It signals an awaiting.” Mathew was telling more than asking. Lucy Butz shifted her feet. “Are we, now?” Jamie dug his hand further into his pocket. There was something in Jamie’s voice that made Berdie’s nose twitch.